For two years, a piece of property located at 2510 Hillsborough Street has been locked in a legal battle. For all this time, an unsightly crane and the unfinished, cement, lower floors of a building have stood where a new apartment building was once planned to be built. The 7-story building would have housed 96 residents and provided street-level retail space. The legal trouble concerns who was at fault for the failure to build the new apartment complex. 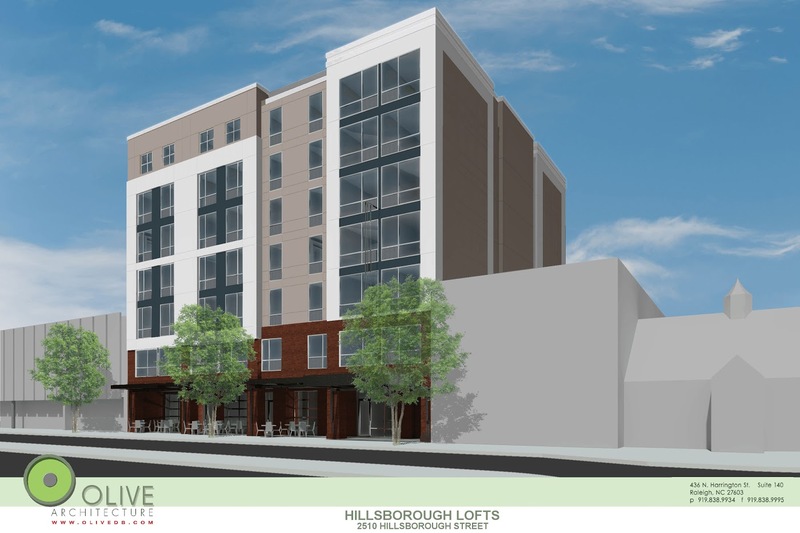 The property developer, Hillsborough Lofts, blamed Wright Construction for slow progress on the project and terminated their contract to build the apartment building. Wright Construction said they were suffering delays because they could not get design information since Hillsborough Lofts had fired their design firm, Olive Architecture, and caused other problems that resulted in setbacks. In August 2017, a panel of arbitrators exonerated Wright Construction and concluded that Hillsborough Lofts was at fault for the failure of this estimated $16,000,000 project. Hillsborough Lofts has now defaulted on its loan, so the site will be foreclosed on. After sitting as a stagnant construction site for around two years, this property is finally going to be sold at a public auction near the end of September. The question remains - what will take its place?